It'a a cool little store. Not my cup of tea as it focuses more on punk and heavy metal - and I also buy mostly used while they sell a lot of new. But they seemed well stocked and it was well done. There's an antique/vintage mall in the north side that has a fair number of vendors with vinyl records - they are having their semiannual sale from 6/3 to 6/11. I picked up an album there for 35 percent off - different vendors have different discounts but most were 20 or more. May be worth checking out if you are up that way. It's Broadway Antique Market. Arizona.. It's a dry heat. My favorites from the 70's and up. Swollen Head in LaGrange. I believe that was around Stone Avenue. Wow , my 1st record shop. A later shop was on LaGrange Road. Forgot the name. It was downtown LaGrange. I remember being shocked when they transistioned to mainly CD. Tape Town near Oak Lawn High School. That guy called himself, The Happy Hippie. Small store - loved the 8 tracks. He later moved to Harlem Ave. Bigger store and was buying vinyl then. It lacked the character of the original store. Probably, Tempo in Oak Lawn. They had good imports in LP era. EJ Korvette in Oak Lawn. This was the bomb for LP and 8 tracks! They had label sales. Example 3 Capitol or Chrysalis Records for 10 dollars. Even a dutch door. You could ask for records back there. Rolling Stone... Get a buddy... Roll a doobie... Take that long trip. Worthy. Hands down...was Chicago's biggest and best single record store. Wonder if it changed hands. No 's' back then. Later years.. Crow's Nest had excellent import CDs. Hegewisch in Hegewisch. They had plenty of hard to find CD titles. Another long ride. Stopped in many shops over the years. Many, came and went..
Burbank Records was good for a few years.. LP era. My earliest records often came from a K-Mart. This was long before I drove. I recall getting new Led Zeppelin albums there. K-Mart would have new release sales. The Compact Disc Store was one of the 1st to offer new/ used CDs. Revolutionary at the time. They offered listening stations. Single tray Sony units with headphones. I still have a Sony player like that..stored. Last.. Best Buy was great for CDs in the early 90s. The Countryside store would order any CD that I requested. I couldn't reserve it. Those would appear in the store stock. They figured that everything would sell. My late Brother and I had big fun on our music missions! Records, 8 tracks, cassettes to CDs. What a gas! Their records show up a lot in my vinyl searches. Still shrink wrapped so their tag is still on the shrink. Sounds like you and I walked a lot of the same ground. Tempo I think was also Wind, on 95th St. I remember ordering an import CD of Queen's Greatest Hits there. Crow's Nest I've already written a lot about here. The single greatest music store I'll ever walk into in my life. It was like a punch in the gut the first time I saw their going out of business signs at State & Jackson. I remember Burbank Records as a store, and then in the late '80s as a meeting/training space for a S&L that I worked for which is also long gone. 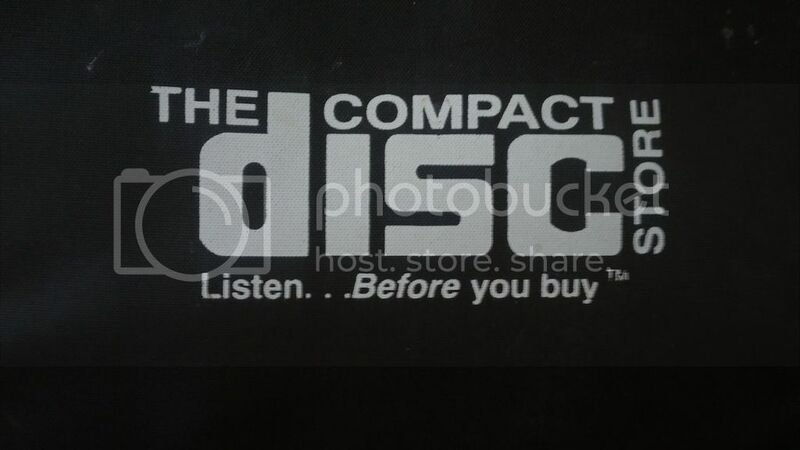 Was the Compact Disc Store that place located in a strip mall adjacent to Chicago Ridge Mall? Not across the street from the mall where the long-gone FYE was, but basically in the same parking lot. longdist01 and T-Bird like this. There a couple of stores along that stretch of Broadway that have used records. BAM is one and Edgewater antique mall is the other. I've found some good stuff in both. Yes. The Compact disc Store was at Chicago Ridge. An outside strip there. Wind sounds right. It was on a corner along 95th. Nice shop. The picture is an old cd carry case from the store. I moved, before a couple of other places that you mentioned. We were crusin' the same territory! Wingsfan2012 and Planbee like this. Hey folks, wondering if some of you old timers can answer a question for me. There was apparently a record store in Greektown on Halsted (about 300 or 400-ish S Halsted) that was in a building that burned down somewhere 7-8 years ago. Does anyone remember anything about this place - the name, who owned it, if they moved or relocated? I enjoyed your entire post, but wanted to respond. The man who owned Bizzy Bee ended up selling tube amplifiers. I really enjoyed his place. Anyone else remember a place called Algonquin Records? Dan and his brother Steve still own it. I occasionally stop there and visit when I see my mom, who's 95 and lives nearby. Andrew, John Porcellino and Hogues like this. I remember Video Beat very fondly, I still have some of those VHS bootlegs floating around. I stopped by often as a friend of mine worked there worked there. I doubt he has any photos but I can ask; feel free to PM me and I'll see what I can do. [...] I am most MOST especially looking for images of the incredible bootleg music video store Video Beat, which was on 2616 N. Clark St., Chicago, IL 60614, and is now a place called Dukes. That place was my favorite ever - imagine a brick and morter Youtube, filled with bootleg contert videos!! I would love to sculpt the store front, (And interior if I can find enough images!) it's the one I most want to recreate! I used to hit those stores often coming in from Grand Rapids 1-3 times a year (yes those stores moved around a bit), I managed Grand Rapids Compact Disc from 1987-90 (left once the boss decided to get Ticketmaster, not a good idea for us) amazingly I don't have a single pic of our place, got some of us hanging out after a record show. I spent so many hours in there & basically memorized it anyways. It was fun to watch the initial blast of import CD coming into the shop. Pretty sure "Rock Records" downtown was called Rolling Stone records the first time I was there (spring break from high school) back in 1983, I went nuts on the Virgin international (cream labels with pink logos) USA vinyl. I did my undergrad work at NIU and shopped at Appletree quite a bit - brings back memories. There used to be another record/CD store almost directly across from it on Lincoln Hwy but I can't recall the name. This was in the late 1980's. Rolling Stones in Norridge was where I bought my first LP: The Stranger by Billy Joel, for $5.98. I told my dad I'd pay him back if he got it for me and that night I dumped a pile of loose change on his office desk, my entire life savings! Later we moved out to Hoffman Estates and I did my shopping at the Flip Side in Barrington Square Mall and the Rose Records in Schaumburg. I have fond and funny memories of the Turntable in Schaumburg, where I bought my first zines and all the underground music I was into in high school. In those days before the Turntable opened, my dad worked around the corner from the Civic Center and I'd have him go into the Rolling Stones/Rock Records on Washington to buy punk albums to bring home for me. I still wonder what the clerks thought of the bald guy in the suit who'd come in and buy Black Flag lps from time to time. Glad I stumbled across this thread. It was a fun read. Hogues, Shawn, This Heat and 3 others like this. Anybody remember record stores in Elk Grove Village, Arlington Heights, & Mt. Prospect during the 1970s? Gotta give it up for the small mom & pop stores on Chicago's South Side. Metro Music had two locations in the Chatham area (maybe more?). Looking back, the selection wasn't all that out of the ordinary, but their commercials used to run during Soul Train. Even better was Mr. T's, which stocked just about everything that was popular in the black community, even the odd white rock crossover. However, it seemed like their hearts were in jazz and blues - as a teenage blues fan, that's where I went to stock up on Jimmy Reed and Chess reissues. At some point during the 90s, Mr. T (Rob Tennenbaum) died, and the place was renamed Coop's, after the longtime employee who eventually bought it. They lasted until the mid-2000s, the victim of downloading. I started buying records as early as age 5. My dim memories of these places include the WVON playlists on the counter, the fact that they smelled like incense, and the older the owners, the more jazz records they were likely to stock. This was the 70s. By the time I was a teenager n the 80s and started seeking out more obscurities, the scene had shifted somewhat - as a connoisseur of older blues and R&B, all the classics I sought were being reissued. I could get these boss new reissues for anywhere between $5 -$8, a good deal. But ten years earlier, either the originals were still in print for $5, or in the cutout bin for $1.99. One Octave Higher Elk Grove Village 1970's? Weren't they also called Discount Records for a while? Next to Pacific Stereo right? My recollection was that the store stopped being a Rose Records around 1994, but continued on with different name and a focus on used vinyl. I don't remember what it was called but "Discount Records" sounds right. I don't remember Pacific Stereo but given I was a broke college kid at the time I wouldn't have if it was there. The Rose Records on Milwaukee was north of Golf Rd, while Pacific Stereo was south of Golf Rd, across from Golf Mill and a few doors from Toys-R-Us. However, before it became Rose Records it was Laury's Records, and had a really big store when I started shopping there in 1981. One of the best I saw in the burbs, and as I recall much larger than the original Laury's in Evanston. They later downsized by about half at the same location (I think the other half became a mattress store or something), and became Rose Records by the late 1980s, about the time they started dumping their vinyl. By that time, they also now had a major nearby competitor in Sound Warehouse, behind that Pacific Stereo south of Golf Rd. I don't remember when Laury's/Rose closed and became a used record store, but I think it was between 1992 and 1994. The name had something to do with California, and I did shop in there once about that time. I was much saddened, though, as I still remembered what had been the much larger Laury's store. By the time I was by there again, even the used store was gone. Ironically, Laury's full name was Laury's Discount Records, but it always seemed to me that their prices were about as high as anybody's, like Border's and Tower would be later on. As for Rose, one of my favorite record stores in Madison WI when I was at UW during 1972-1977 was Record World on State St, with another store called Discount Records right next door. Discount Records had bigger selection but higher prices, so I always went to Record World first. They had this great deal every Friday where you could buy three single albums for ten bucks flat, all releases. Hard to beat those prices. Well, when I was back up for football games in the 1980s, it also had become Rose Records. There was also a Sounds Good store in Northbrook, closed about 1981, which became a Rose store. I think they kept their Sounds Good name, but they had the telltale Rose starburst price sticker on the shrink wrap. Sound Warehouse became Blockbuster Music in 1992 and then went straight downhill selection-wise after that, before finally fading away in the mid-1990s. By that time, however, Tower Records and Border's were arriving on the local scene just in the nick of time. saturdayboy, mschrist, kevinsinnott and 1 other person like this. I recall a One Octave Higher in Evanston as well, shopped there about 1972, at the north end of Orrington just past the hotel. The flagship Laury's Discount Records was about a block over on Sherman, and there was also Hear Here on Dempster by the tracks. All good stores. But the One Octave Higher was gone not long after I was there in June 1972. 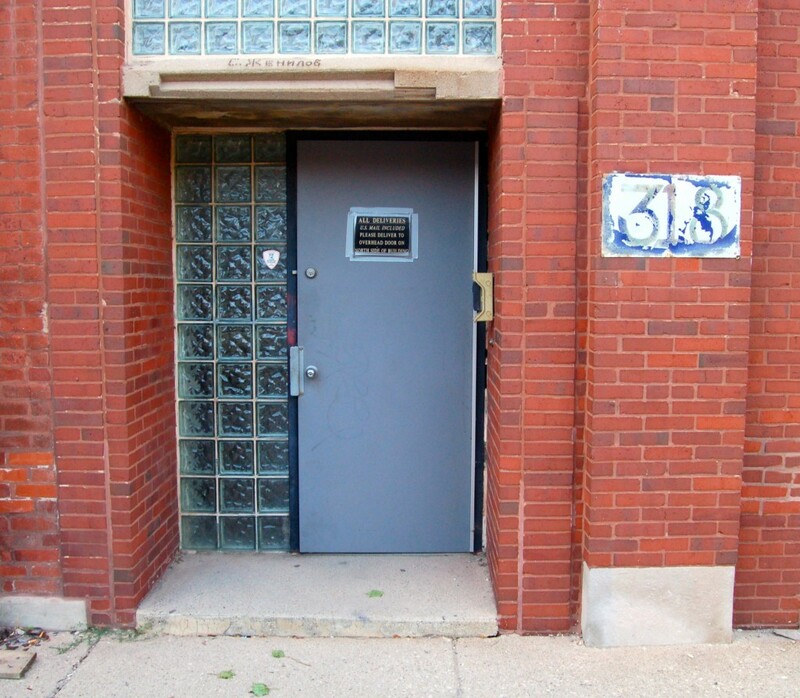 Can you guess what Chicago "store" this entrance door is to? One of my favorite haunts, Music Direct, on Laflin. Don't forget to ring the buzzer to get in. I still go to their newer location on Bryn Mawr by the "L" tracks. saturdayboy and Chris from Chicago like this. Picked up a lot of CD's there over lunch breaks after a few Training programs close to Touhy ave. area. One of the staff "Dave" or "Dan" was in helping move merchandise from a backroom and a moving truck arrived with some items and furniture pieces, amongst the stuff was a huge wooden panel sign from Aaron Russo's Kinetic Playground (late 60's early 70's rock club) on Clark/Lawrence street in a former roller rink. I have a couple pictures of it displayed by the store imbedded in the ceiling tiles for about 6 months time frame until Flipside owners moved it to another location. I will try to find the picture and post it, sorry for the long write-up! I only went to that location once and it was when it was Record Surplus, which is a California store as you mentioned. Didn't know it was a Rose before that but I didn't hit that area very often. I remember really liking Record City in Northbrook. They had a great import selection. You would have loved the former Rose in its prime, as Laury's in the late 70s to mid-80s. Twice as big with huge selection. The last of vinyl's golden age. Tons of imports and all of the audiophile vinyl of the day (MFSL, Nautilus, Direct Disk Labs, etc.). It was sort of like Tower Records would later be in the 1990s, but with mostly vinyl and a few (early) CDs, instead of the other way around with mostly CDs and a few (late) vinyl LPs. By the late 1980s, they had subdivided off half the store which became (I think) a mattress store, renamed as Rose, and started dumping their vinyl in favor of CDs taking their place, though not necessarily in that order. With a Sound Warehouse a couple of blocks away selling CDs for less, the handwriting was on the wall. When I went to the Record Surplus you mentioned at the same location in the early 1990s, I almost teared up from remembering what it had once been. Little did I know then that those losses were truly small potatoes compared with what has happened to the retail landscape today. The arrival of Tower and Borders in the mid-1990s would boost my spirits for a while, but that turned out to be a short-lived catharsis. It's sad how things have changed in the music world in our lifetimes. Sometimes I really miss the pre-internet days and going into a record store with no idea what new treasure had been released since you were last there. It was exciting coming across a new album by an artist you loved and holding it in your hands. I worked at the Vernon Hills Rose Records in the mid-80s but I think that was a relatively small location and they were already CD heavy by that point. I do remember all the Beatles MFSL vinyl though. They had that strange system of putting new records in outer sleeves with store ID stickers on them to track inventory. I go back well before Borders, Tower and Best Buy, before Sound Warehouse and Rose, even before Laury's, Flipside and other chains from the 1970s. Before I got my driver's license, excluding record sections in department stores, mass discounters (e.g. Turnstyle) and smaller discounters (e.g. Woolworth's), the backbone of record retailing were the mainstreet mom and pop record stores. Every suburb and city neighborhood had at least one. Very often it wasn't even just a record store, but an appliance store that sold TVs, record players, clock radios and the like. Around where I grew up in Winnetka, it was Porter Electric on Elm Street and L&A Stationers on Lincoln. In nearby Wilmette was Paul's Recorded Music, which also sold some art supplies. There was another place in Glencoe named Wally something. All of those independent main street mom and pops were driven out by the first chains like Flipside (one arrived in Winnetka about 1970). With the ability of chains to discount with their purchasing power, the math just didn't work anymore for the independents. Either become a chain yourself, sell out to a chain, or close up shop. L&A stopped in 1968, switching the record section with its headphone listening stations over to a large greeting card section. The chains not having arrived in Winnetka as yet, perhaps they were motivated by a desire to cater to their main base of North Shore matrons who might be scared away by an increasingly scruffy and aromatic hipster clientele buying LPs during that time. Porter stopped selling LPs about 1970, but was able to keep selling 45rpm singles as before, keeping that Rek-o-Kut turntable up at the counter in business. LPs became the almost the exclusive province of Flipside. Those two market segments by 1969 were catering to entirely different demographics, the former being middle school bubblegum-teeny bopper-Tiger Beat girls listening to Bobby Sherman and David Cassidy on AM radio, and the latter to older, slightly buzzed hipsters listening to album rock on FM, and who expected at least to be able to buy concert tickets and rolling papers. Paul's in Wilmette was the last of the independents in my area to go, in May 1974. An ARS record store opening not far away was likely the final straw for Paul. Things continued for about a decade with the new chains, until LPs started losing out to cassette in the early to mid-1980s, then even CDs in the late 1980s, before almost disappearing from the scene altogether. A new group of larger chains came in during that time, or grew from smaller chains, like Laury's, Rose, Sounds Good, then Sound Warehouse arriving in the late 1980s to begin driving those other chains out, before becoming Blockbuster Music and immediately going into decline. The final group was Best Buy and Circuit City, followed by Tower and Borders, ushering in one last golden age of recorded music retailing. Crow's Nest and Rolling Stone were great as well. After the last peak sales year about 2002, the final decline was underway. Tower bit the dust about 2006, Borders then followed years of shrinking CD sections before closing in 2011, Circuit City was already gone by 2009. That left Barnes & Noble, which on closer inspection carries very few CDs these days. Best Buy and Target are dropping CDs altogether this year (2018). Ironically, today's Barnes & Noble new stock LP section, though nothing like the good old days through the mid-1980s, dwarfs even the CD section at the same stores now. The culprits delivering the final fatal wounds were MP3s at first, then Amazon's rise to absolute supremacy. I shop at Amazon myself(along with Music Direct and Acoustic Sounds), but mainly because there is no other choice. At least, for now, I can go to a Barnes & Noble that is still open to get that old feeling of flipping through the bins. Today, almost any "record store" or other retailer selling recorded music cannot sell new (unopened) product alone, but must rely on a fairly robust used section. Who knows how long even that will last? MartyTem and jamesc like this.